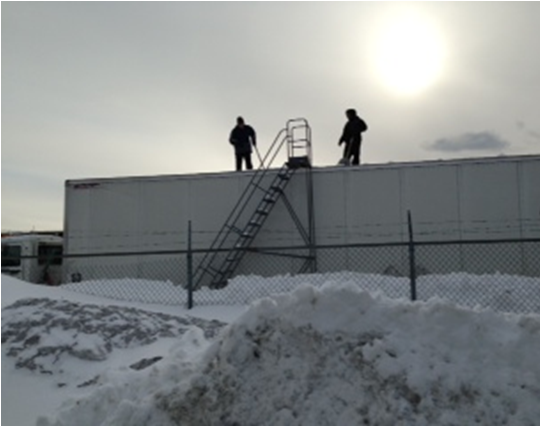 Safety –Removes need for any personnel to be on or near vehicle’s rooftop for clearing of snow. Eliminates accumulated snow effectively from rooftops thereby decreasing potential for damage and personal injury to other motorists during transit. Mobility – The only hydraulically powered method that is mobile and does not require permanent infrastructure for operation. 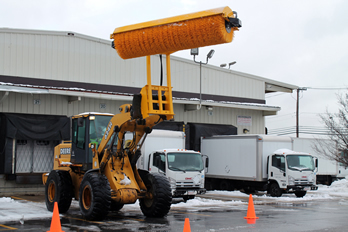 After snow clearing, TrucBrush® is easily moved from the facility freeing up real estate. Fast – The TrucBrush® clears accumulated snow from a trailer truck in less than one minute, and even less time for boxcars and smaller motor carriers. The TrucBrush® operator can quickly change the height of the TrucBrush® to allow for varying truck heights. Efficient –The TrucBrush® is made of high quality polypropylene bristles and clears snow evenly throughout the truck’s rooftop with one pass. 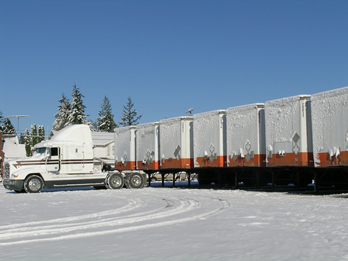 Economical – The TrucBrush® method results in significant annual savings in solving one of the trucking industry’s largest winter related problem.